Culiacán ( kuljaˈkan ) is a city in northwestern Mexico. 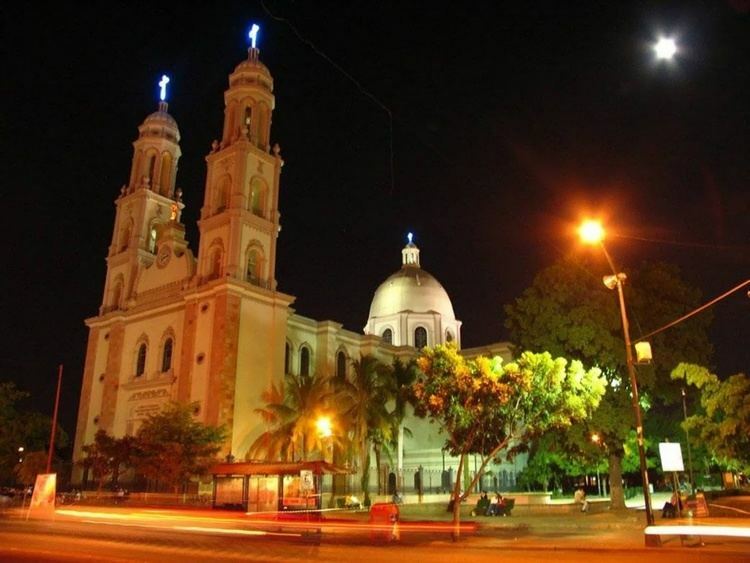 It is the largest city in and the capital of the state of Sinaloa. It is also the seat of Culiacán Municipality. 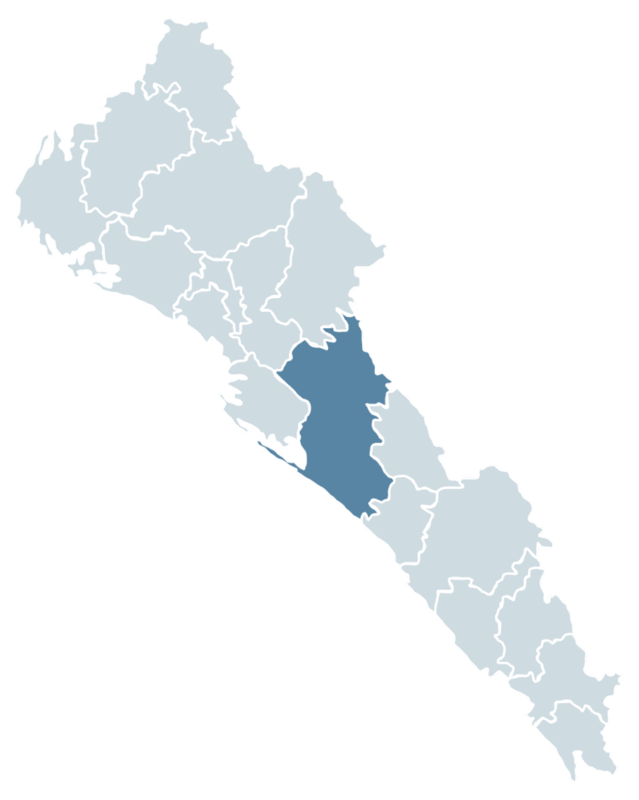 There are 675,773 inhabitants in the city (census of 2010) and 858,638 in the municipality. While the municipality has a total area of 4,758 km2 (1,837 sq mi), the city itself is dense, at only 65 km2 (25 sq mi). The city is located in a valley at the confluence of the Tamazula and Humaya Rivers, where the two meet to form the Culiacán River, 55 m above sea level. It is in the center of the state, at about the same distance to the other urban centers of the state: Los Mochis to the north, Mazatlán to the south, and Altata at the west. The most accepted translation would be Colhuacan "place of those who adore the crooked god Coltzin". Other translation may be that come from the word coahuacan, which can mean "palace of snakes". Before the Spaniards arrived from Europe, this site had been a small Indian settlement since 628 when Amerindians had first founded it. The city existing today was founded in 1531 by the Spanish captain Nuño Beltrán de Guzmán and named San Miguel de Culiacán. In the same decade, it was the terminus of the long journey of Alvar Núñez Cabeza de Vaca and company among natives. Explorer Francisco Vásquez de Coronado set out from Culiacán to explore what is now the southwestern United States. Settlers from Europe came to Culiacán, and in the following centuries, Culiacán continued to be a quiet town. Only after the federal government built dams in the adjacent areas in the 1950s did agriculture explode and the city began to grow exponentially. Some of Mexico's largest agricultural conglomerates operate in the vast and fertile coastal plains. The agroindustrial economy continues to be the single largest contributor to the region's legal economy. While the vast majority of technical and skilled labor is educated locally, the once-seasonal field labor pool now experiences a yearly shortage of workers. International patterns of migration now draw laborers from deep within Mexico's south to the northern border states and into the United States. Beginning in the late 1950s, Culiacán became the birthplace of an incipient underground economy based on illicit drugs exported to the United States. The completion of the Pan-American Highway and the regional airport in the 1960s accelerated the expansion of a workable distribution infrastructure for the enterprising few families that would later come to dominate the international drug cartels along Mexico's Pacific Northwest. Culiacán has a semiarid climate (Köppen: BSh), despite receiving an annual rainfall over 600 mm (24 in), due to its hot temperatures and high evaporation. Summers are very hot and humid, shade temperatures can reach 45 °C (113 °F) and high humidity can produce heat indices of 50 to 55 °C (122 to 131 °F), with the risk of heavy rainfall from decaying tropical cyclones also present. Winters are much milder with less humidity and an average high of 27 °C, with cool nights. Culiacán's economy is mainly agricultural and commerce, being a trade center for produce, meat, and fish. Among other industries, Culiacán represents 32% of the state economy. Some companies of national importance are headquartered in Culiacan, such as Coppel, Casa Ley, Homex, and others. The Sinaloa Cartel, a drug-trafficking and organized crime syndicate, is based in Culiacán. The total population of the city is 675,773. Immigration to Culiacán comes from all parts of the world, but especially from southern Mexico, Japan, China, and Europe (Italy, France, Spain, Germany, Greece). The newspaper El Debate is published in Culiacán. At present, Culiacán has just over 68 urban transport routes, which serve about 1 million users. The Culiacán urban transport is operated by RedPlus. The city has a train station, operated by Ferromex, and it is used only to transport freight. It is connected to south with Mazatlán and north with Guaymas. Culiacán uses the Central Internacional de Autobuses "Millennium" ("Millennium" International Buses Station) to travel across all Mexico (north, central, and south) and to the United States (Arizona and California). This replaced the old bus terminal in the southern city. Though several high-speed roads have been built, most of the city's streets are rather narrow and traffic jams are common at rush hours. Now, 300,000 cars are in Culiacan, making the per capita number of cars one of the highest in the country considering the 745,000 inhabitants. Culiacán has several roads (avenues, boulevards, streets, etc. ), but some of these are the main quick connection to other points of the city. The city has a total of 13 bridges: six across the Tamazula River, two spanning the Humaya River, and the longest one with other four crossing the Culiacán River. Efforts to solve traffic problems have been made, but most of the city streets and bridges are now crowded and insufficient to handle regular and rush hours traffic; a 40-km/h speed limit in most parts of the city worsens the situation. Also, Culiacán has bridges in streets conforming to high transit systems in places where the rush hour is common. On Feb. 17, 2014, investigators from Mexico and the United States learned Joaquín Guzmán Loera, or El Chapo, was using underground sewage tunnels in Culiacán by constructing hatches connecting to the drainage network in the bathtubs of his city "stash houses". On at least one occasion, authorities chased Guzman into the tunnels, but lost him. An AP reporter said some of the tunnels were well lit, had wood paneling, and were air conditioned. Culiacán is a rail junction and is located on the Panamerican Highway that runs north to the United States and south to Guadalajara and Mexico City, and the Benito Juárez Highway or Maxipista, which is a toll road that runs parallel to the toll-free federal highway. It is connected to the north with Los Mochis and to the south with Mazatlán, Tepic, and Guadalajara with the Federal Highway 15. Culiacán is linked to the satellite city of Navolato by an excellent freeway that now reaches Altata, in the Pacific Ocean coast. Culiacán is also linked to Tamazula de Victoria in Durango state. Culiacán is served by Federal de Bachigualato International Airport (IATA: CUL, ICAO: MMCL), the most important domestic gateway in the state of Sinaloa, and the second in international operations after Mazatlán International Airport. It is located south of downtown; it is also the 10th Mexican Air Force base. Imala's hot springs are about a 30-minute ride from the city and close to several dams and reservoirs, where one can fish largemouth bass all year round. Altata beach, located 30 minutes from Culiacán, has had extensive development over the last few years. It has a "sister" beach called Isla Cortés or Nuevo Altata, where this project of travel destination, has begun with some restaurants and private areas. It is famous for its blue sea, white sand, modern restaurants and bars, nightclubs, and high sea waves. The Cathedral, a 19th-century church, began construction in the 1830s. Plazuela Alvaro Obregón was the place for social gatherings in the 1800s. La Lomita or Templo de Nuestra Señora de Guadalupe is the tallest church in Culiacán, situated on a hill with a view of the entire city. The Centro Cultural Genaro Estrada, known by the locals as "Difocur", encompasses a theater, movie theater, a café, and a group of museums specialized in local culture. DIFOCUR is also the home of the Orquesta Sinfonica Sinaloa de las Artes. The OSSLA performs a 42-week season (September to June) of symphony, pops, opera, ballet, and chamber music, and features musicians from more than 15 different countries, including Mexico, the United States, England, Scotland, Canada, Romania, Argentina, and others. Working under the auspicies of the government of Sinaloa, the OSSLA also performs many outreach and educational programs around the state of Sinaloa, as well as throughout Mexico. The Regional History Museum in the "Parque Constitución", a large art museum downtown and a number of small art galleries, is owned by several of the local universities. The Botanical Garden and Centro de Ciencias de Sinaloa, a science museum, holds the fifth-largest meteorite on earth. A baseball stadium, the Estadio Angel Flores, is the home of Los Tomateros de Culiacan; a bigger football arena, called Estadio Banorte (formerly Estadio Carlos González), is the home of Los Dorados de Sinaloa, a Mexican football team. Several university stadiums are also available. In Downtown, the best preserved old street is the calle Rosales, between Rosales square and the Cathedral. FORUM Culiacán Mall is the largest mall in Culiacán. It offers Liverpool, Sears, Steve Madden, Pull and Bear, Zara, C&A, Lacoste, Nine West, Victoria's Secret, MacStore, Starbucks, Sanborns, and Tous stores, a Cinemex movie theater, MixUp, boutiques, kiosks, a food area, and an HSBC. Plaza Galerias San Miguel is the second-largest mall. It offers Sears, Citi Cinemas movie theater, and mainly shoe stores. Plaza Cinépolis is a modern plaza/little mall in the western part of the city, and it is the only place in Culiacán where one can find the Cinépolis movie theater. It offers many boutiques, some famous restaurants of the city, including Sushi Factory and Italianni's, the Antártica Ice Rinkand Royal Yak casino, and the office supplies store Office Depot. Plaza Fiesta is a plaza located in the city center. It offers Coppel, a Ley Plaza (supermarket), restaurants, little boutiques, and shoe stores. Plaza La Campiña is a plaza mall in the eastern section of the city, near the Culiacán River. It offers Pavi, Coppel, a Mega Plaza/Comercial Mexicana (Super Market), many boutiques, jewelers, and seasonally a go-kart track. Ernesto Millán Escalante Park (previously known as Culiacán '87) has many pools, attractions, an artificial lake, gardens, sports courts, the longest water slide in northern Mexico, and an open-air Hellenic theatre. Constitución Civic Center, Culiacán's civic center, is located in the eastern city at the Malecón Viejo, facing the Tamazula River. It has the Culiacán Library, the Culiacán Zoo, the second Dancing Fountains in the city where people go when it is hot, sports courts, a big run track, and a Hellenic theater. Las Riveras Park is located around the Tamazula river, between Forum Culiacán Complex, the Isla de Orabá park, the Malecón Viejo, and the Malecón Nuevo. It has only pedal boats and a tyrolean across the river, and a bike path and recreational games. Splash Club! is one of the largest water parks in the state of Sinaloa. La Primavera is a small and private urbanized zone in the south of the city; it contains many houses, two schools, a little mall next to channel, a sport club, and a group of channels connected to the biggest lake in Culiacán, where anyone can fish and go camping. El Conchal and other small villages with a population of 500 or less are located 8 km from El Dorado. There, people live on fishing and tourism. The city is home to three professional league sport teams: baseball with the Tomateros de Culiacán from the Liga Mexicana del Pacífico, two championships in Caribbean series in 1996 and 2002; and soccer with Dorados de Sinaloa, who play at the Estadio Banorte (Estadio Carlos González) and basketball with the Caballeros de Culiacan from the CIBACOPA. Duck, dove, and goose hunting season goes from early November through March. Culiacán also holds a yearly international marathon.